« When will Israel attack Iran? This is is in addition to legal exemptions to sanctions. 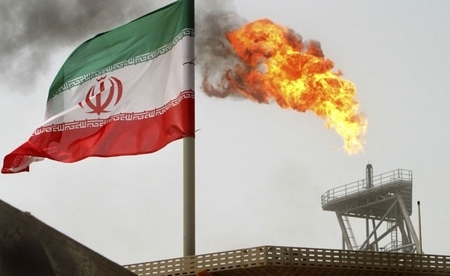 The three largest importers of Iranian oil, China, Japan and India have been granted exemptions in return for reducing their Iranian oil imports, but not ending them. South Korea, the fourth largest, has temporarily stopped, but intends to resume shortly. Overall, 20 nations have such waivers, and the Iranians claim that 80% of their oil economy is unaffected (probably an exaggeration). There is no question that the Iranian economy is being hurt by sanctions. But, from the point of view of the regime, it’s a small price to pay to (in their view) make it possible for them to kick the Big Satan out of the Middle East, destroy the Little Satan and ultimately spread the Shiite Islamic revolution throughout the region. If there ever was a game changer, an Iranian nuclear weapon would be one. Imagine if, in early 1945, the US had faced economic sanctions aimed at the Manhattan Project. Would we have pulled back with success a few months away? Let every citizen know that things are never going to be the same again [if Israel attacks Iran]. I am not talking about the weapon systems Israelis will have to face. Rather, I am talking about the more mundane aspects of our lives — an end to Israel being a leading economy that is inundated with foreign investment; an end to inbound tourism. But the way things are right now, the decision-making apparatus’ conduct is worrisome. My goal is to shed light on the elephant in the room; namely, that Israel will be a different country altogether after an attack. Its economy, its socio-economic landscape and its society will all look utterly different. Thus I call on the government and the people to engage in a dialogue that would do away with Churchillian speeches before we go on the attack. He may be right that a preemptive strike would have far-reaching consequences. In fact, I’m sure he is, although it’s hard to predict what they will be. What he fails to mention is that not preempting will also have consequences, even if a nuclear weapon is never used against Israel. Not preempting means violating the principle that has served Israel well in its darkest days, that of not depending on other nations to protect it. At best, the US would attack Iran and destroy its nuclear capability. In that case, Israel would still suffer strikes from Iranian and Hizballah missiles, as well as needing to go to war against Hizballah. How would this be significantly different from Baram’s scenario? And what would be the consequences for Israel of becoming a protectorate of the US? Of course there is also the case in which the US, for whatever reason, changes its stated policy and chooses to allow Iran to develop nuclear weapons. Even apart from the direct security consequences stemming from an Iranian nuclear umbrella, wouldn’t Israel be a “different country forever” in this new world? Wouldn’t foreign investment and tourism be severely punished? Baram thinks that the Israeli government needs to involve its citizens in a national dialogue about what to do. Unfortunately, the question of what to do and when to do it depends on a great deal of information that simply can’t be public. Although there are many issues about which public debate is indicated, even essential, this isn’t one of them. This entry was posted on Monday, August 6th, 2012 at 12:18 pm and is filed under General. You can follow any responses to this entry through the RSS 2.0 feed. Both comments and pings are currently closed. Baram is one- sided and does not see what you rightly see i.e. the negative consequences of not pre-empting. But he is not wrong to claim that the consequences of attacking may be very severe. In fact this has been one of my hidden worries, that the attack , especially should it go wrong, will be an invitation for the grand aleihum upon us, and for our unraveling. In other words there is a question of which consequences would be worse. Prime Minister Netanyahu clearly believes that allowing Iran to become a nuclear power is the worst thing of all. Considering the destructive power of nuclear weapons that is probably right. It is easy for me to say things from the relative safety of the U.S. (though not as safe as one may think…allegedly, Iran/Hezbollah has sleeper cells in the U.S. ready to strike in the event of an Iranian crisis; it is well-known that Hezbollah operatives have been discovered mixed up in Mexico’s drug war, and elsewhere in Latin America). Still, to the extent that my background allows me to make an educated guess, Baram is right in the short-term but probably wrong in the long term. Taking a historical perspective, Israel was much poorer in 1967. Per capita income then was about $1500 versus around $30K today. Israel had no serious technological edge over her adversaries, and was outnumbered – depending on category (e.g., aircraft, tanks, etc) anywhere from two-to-one up to four-to-one. The U.S. was sympathetic to Israel – at the street level, probably more sympathetic than today – but Congress sure was not. Johnson said nice things but did nothing substantial to help Israel on the eve of war, and warned Israel not to strike first. We all know what France did. The USSR blustered against Israel as well. Many in and outside of Israel thought there was a very good chance she’d be overrun; even that tough old bird, Ben-Gurion, was afraid of this. Today, Israel has a vast technological edge over her adversaries, including Iran. She has incredible power at her disposal compared to her immediate neighbors, who despite all their jumping up and down and screaming, are mostly broke and starving. I’m not under any illusions. I realize this is going to be a very tough war. Israel will probably suffer more civilian casualties than in any of her previous wars. But we have to remember that imprecise rockets – and that is the most powerful weapon Israel’s enemies have – are terror weapons first and last, not unlike Germany’s V-1 and V-2 weapons of WW2. They rained all over Britain not for weeks or months, but for at least a year or so. They landed everywhere, in the heart of London and beyond, and killed thousands of civilians. And they did not postpone by one day Germany’s ultimate defeat. They did not slow down the allied war effort one iota. Oh, and Britain did not have anything like “Iron Dome”, either. The worst part of all of this is not Iran, as bad as they are, but having to deal with the traitorous stooge Obama at the helm of Israel’s most important erstwhile ally. And though, Vic, you have opined elsewhere that the timing and effects of Israeli action with respect to U.S. leadership and the coming election are likely irrelevant to Israeli leaders, I beg to differ strongly. The great Chinese military theorist, Sun Tzu, wrote that one of the most fundmentally important objectives in warfare is to isolate one’s opponent, to break up their alliances. A U.S. that behaved something like a “normal” ally as this is commonly understood would make a huge difference in this equation, and go a long way in giving pause to Israel’s adversaries. Even if it had no immediate effect on Iran’s program, how much easier it would be for Israeli military planners to prepare for a strike against Iran if they knew they could count on the backing of the U.S., even in terms of logistics and diplomatic support, which is all they would ever ask. Everybody on all sides of this conflict knows this very well. That is why it is so disastrous to have Obama in office, and I’ve told you before, and I”ll say it again: THAT IS NO ACCIDENT. But if and when war comes, Israel will prevail. She’s been through worse, at least in terms of the direct military contest. During the war and in it’s immediate aftermath, certainly Israel will not exactly be the high-tech economic jewel she is right now. But the mess will be cleaned up, and if the Iranian threat is in fact decisively removed, a far better day awaits. On the other hand, if the arguments of the likes of Baram carry the day, and Israeli hesitates, allowing Iran to get the bomb, if that regime survives to produce a credible force of two or three dozen warheads for their IRBMs, there WILL be a nuclear war and the whole region, including Israel, will likely be destroyed. What kind of future is that??? ?